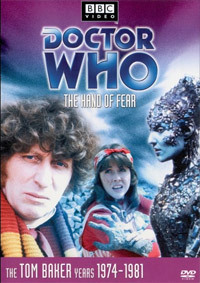 The Hand of Fear was Sarah Jane’s last story as a regular companion. 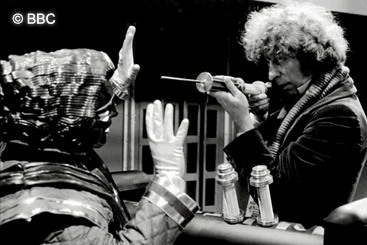 To ensure the dialogue in their farewell scene was as true to character as possible, Tom Baker and Elisabeth Sladen co-wrote their lines alongside the show’s Script-Editor, Robert Holmes. Careful. That’s not as ‘armless as it looks. 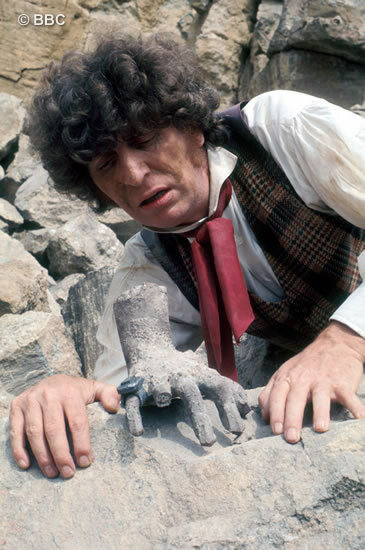 Tom as The Doctor examines the fossilised hand. 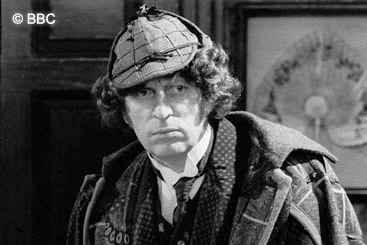 The TARDIS ferries the Doctor and Sarah forward to present day England, but lands in a quarry just in time for the pair to narrowly escape being buried under a rock-clearing explosion. The blast uncovers an ancient, semi-fossilised hand. But this hand is far from inert. A stone ring from one of the fingers, begins exerting a hypnotic influence over the concussed Sarah, compelling her to take both ring and hand to a nearby nuclear power station. Sarah uses the ring’s power to bring other technicians under its spell, one of whom feeds the hand into the nuclear reactor. Radiation enables the hand to regenerate the rest of its body. 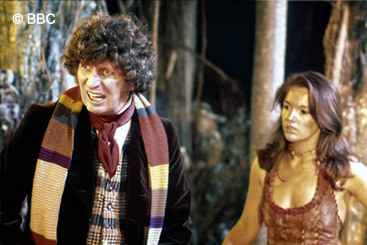 When the Doctor arrives, he is confronted by a fully animated silicon statue, with the face and form of a beautiful woman. 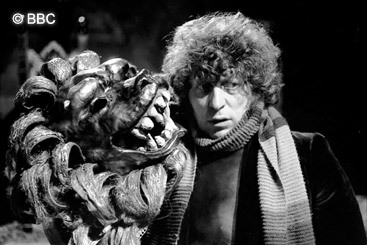 The creature, a Kastrian named Eldrad (Judith Paris), a member of Kastria’s ruling elite, persuades the Doctor she was originally the victim of alien attackers who believed they could kill her by detonating her body in space. Now she wants to return to her world, to see if she can lead her people again. 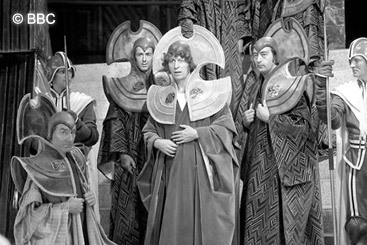 The Doctor takes her there, but discovers Kastria is now a dead planet, a frozen wasteland ever since vital thermal barriers were destroyed. The Doctor learns the truth from an ancient recording – that it was Eldrad who had both created and later destroyed these barriers after Kastria’s rulers had refused the scientist’s demands to become Emperor. But when Eldrad decides Earth will make a suitable target for her to conquer, the Doctor executes a well-timed trip-up manoeuvre with his scarf, pitching the creature into a bottomless crevasse.